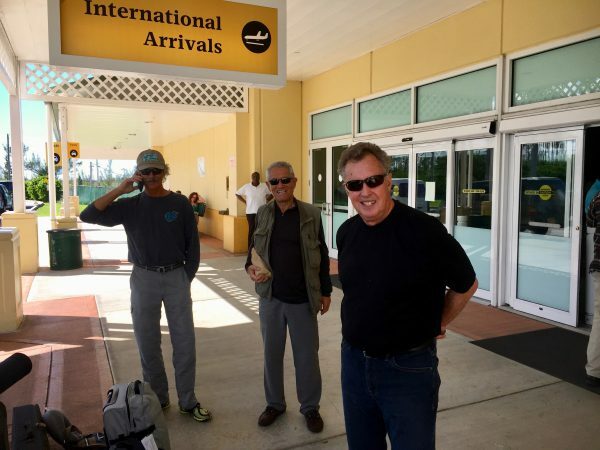 Last November I fished for bonefish in the Bahamas with three of my friends. They are all experienced bonefish anglers, but I am not. 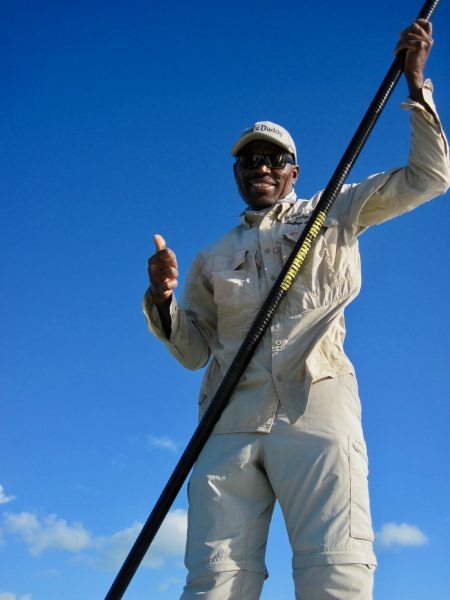 I was very much looking forward to this trip to learn more about bonefishing. As it turned out, this trip was great and surprisingly the company, too. Our destination was Water Cay on the north side of Grand Bahamas. 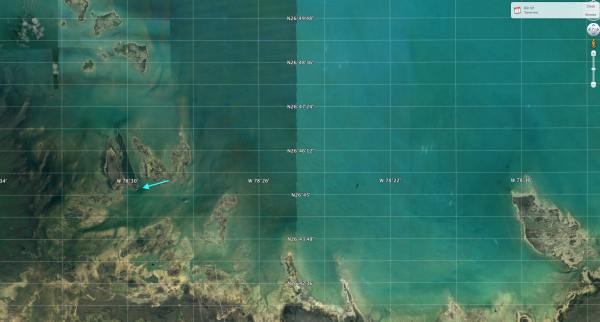 This location is off the beaten path with low fishing pressure, but with a reputation for big fish. To get there we flew into Freeport, where we were picked up at the airport by our guides. From there to the marina where the skiffs awaited us is about a 40 minute drive. Our gear was stuffed into the skiffs, and we reached our destination in 20 minutes. From where I live (Florida Panhandle) I got there in half a day’s travel. 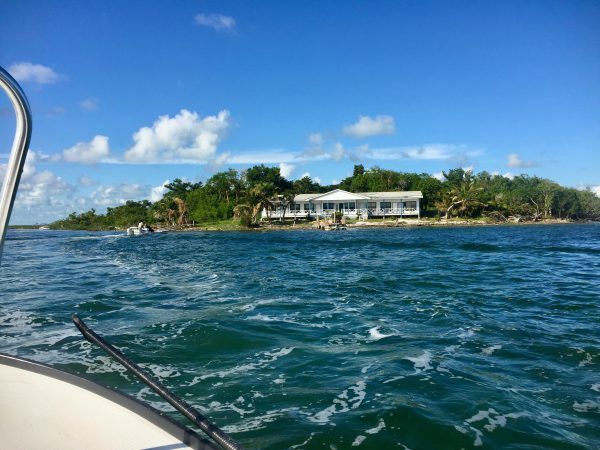 The lodge sits on the south tip of Water Cay with a small jetty. There are 3 double occupancy rooms on the left side for the anglers, and the ambiance is pleasant. The cooking and housekeeping was in the capable hands of Kay and Syd. The meals – both plentiful and good – were served in the dining room in the middle of the house. 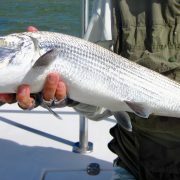 Bonefish are a very challenging fish to catch. To do so you have to spot them. If you hook one you are in for a surprisingly fast run that will take you into the backing. 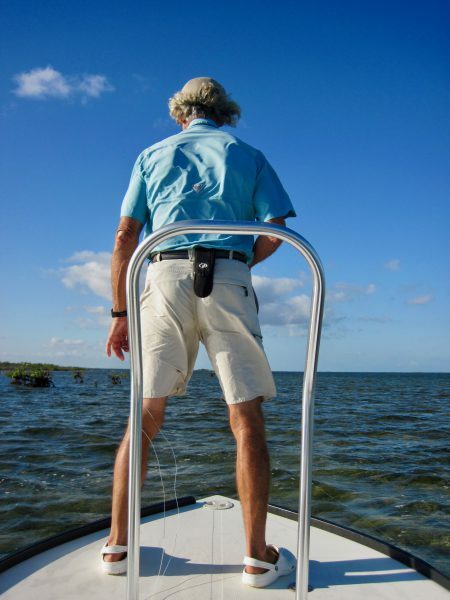 If fishing from a skiff the angler should take a ready position at the bow. The guide is up on a poling platform in a better position to spot fish. When he does, he guides you to their position and if you are lucky, the fish can be reached with a cast. The skiffs used are shallow draft, very light, and with a poling platform. 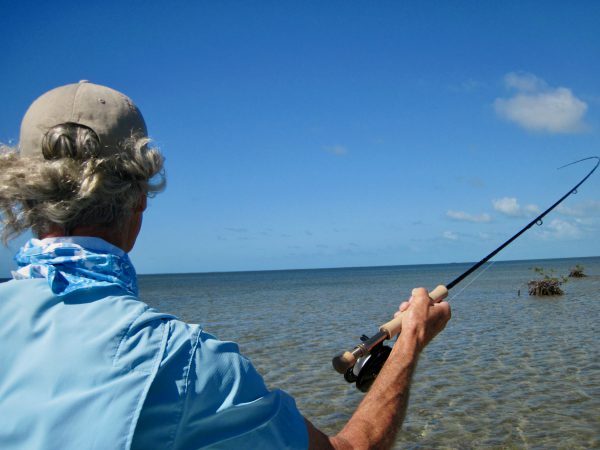 Bonefish can also be caught by wading the flats. Spotting them from a lower position is more difficult, but doable. 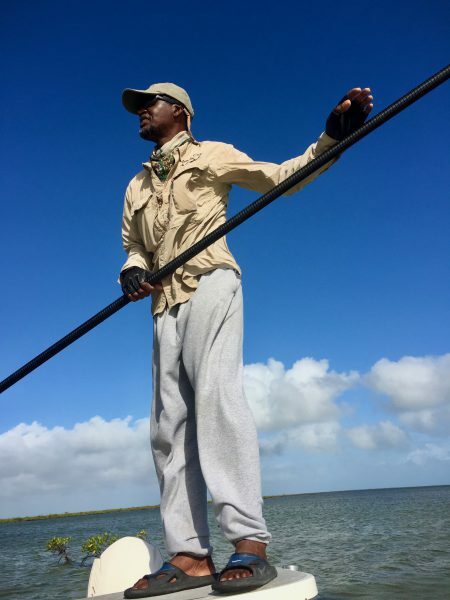 Sometimes after finding a fish, the water is too shallow for the skiff. Then you try to get into a position by wading. 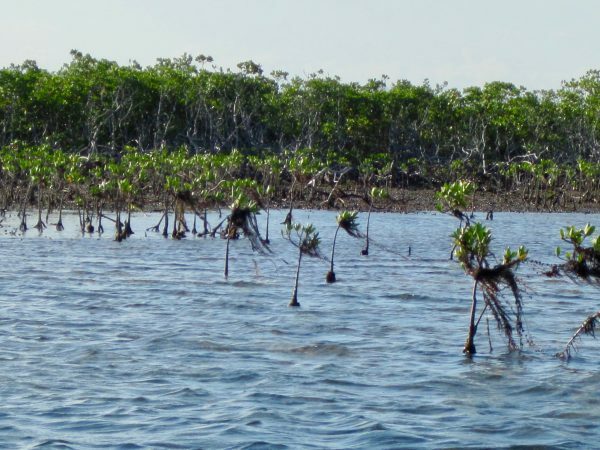 There are endless flats around the lodge and plentiful of mangrove thickets. 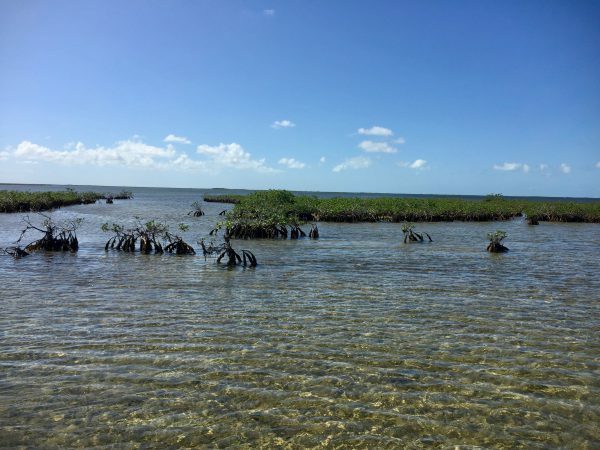 These flats are a veritable smorgasbord for the fish as the tides move water onto and off the flats. Crabs and shrimp also move in, and the bonefish like to feed on them on the bottom. 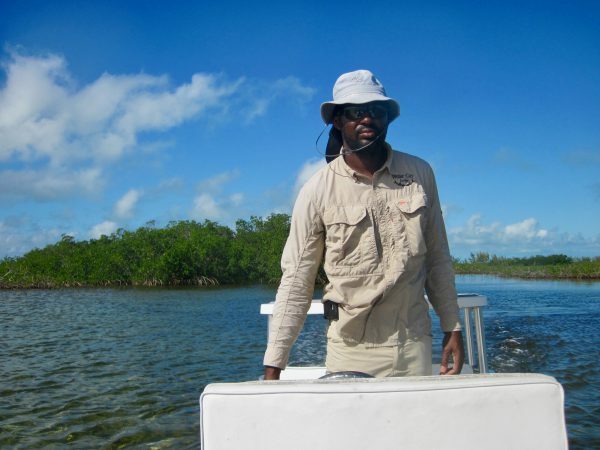 Bonefish use the mangroves to escape and love to tangle you up by swimming through them. The three guides: Sidney was the headguide, and Greg and Esra were very good guides too. They found fish everyday. Unfortunately, only some were caught, but that is on the angler. The wind was a factor, and there were two cold fronts that came through during our stay. You get the picture. There were many more variants of my ineptitude, but when I did everything right the fish took a look at my fly and sometimes grabbed it. (This is the Anna Karenina principle of fishing. Its first sentence: “Все счастливые семьи похожи друг на друга, каждая несчастливая семья несчастлива по-своему.” The standard translation: “All happy families are alike; each unhappy family is unhappy in its own way.” Paraphrased: you succeed at bonefishing in only one way, but you can screw up in multiple ways. After this trip I am confident that my skills have improved, thanks to their excellent teaching. We all caught fish, and I lucked into a 7.5 pounder that is my personal best in bonefish. I did not fish with Dave, so I have no picture of proof, but he caught fish, too. This sums up our time there, and I plan to be back there next fall. is difficult but exhilarating. Their runs are spectacular, and they are sneaky and run into the mangroves and out again to tangle you up. It is not a given that you land the one you hooked. However, that is in itself the most exciting part. To catch one you need several aspects to be aligned. First off you must see the fish, then can you cast to it and on and on. I have broken it down to the following parts to clarify my thinking and to give you an idea of the complexity involved. It is always best to have sunshine, then they fish will have a shadow that you can spot, and that will lead you to the fish. It is best to keep the sun behind you so you do not have to look into the glare from the surface. How the sun is moving and how you are moving is important, and the guides set up their poling paths to take advantage of that. So trust your guides to do that part – you are in their home waters. On an overcast day the fish can still be spotted, but it is much harder. Pay attention to the clouds and how they are moving, since this directly affects visibility. If you are under a cloud, but there is sunshine “over there,” you move over there. Be prepared for the wind. You might have to cast into a stiff breeze. The wind might be blowing onto your casting side, pushing the line into your body. You might have to make your back cast into a hard wind, and you must be able to solve that. Very rarely is the wind direction “right” and the wind light. The only advice I can give is that you should practice the “wind” casts before you go there. Line control is important in the wind. Mostly you can let the line loose on the deck if you take care to get it into the lower well of the skiff. There your fishing buddy can keep an eye on it and clear tangles. It is advantageous to place this line between the leaning poles – it seems to help control the line. One day it was blowing so hard that I had to hold the loops tight in my left hand. A very big loop on my pinkie, a slightly smaller one on my ring finger, and a smaller still on my middle finger, similar to what one can do when using a two handed rod for salmon. Then you shoot it out when opportunity arises. As the tide inundates the mangroves, bonefish move into that maze to feed. When the tide falls the fish move off again. So, it is vital to be cognizant of the tidal movement. However, reading a tidal almanac is not enough. Wind can block the water from rising and conversely can block its egress from the flats. Local knowledge is the key, and the guides are tuned into this. Bonefish rarely keep still. I saw countless bonefish that turned out be sticks on the bottom. “Not moving – bottom,” was the guides refrain. When you see a fish and it is moving, you must place the fly in front of him. For that you have to gauge the speed at which the fish is moving. You assume they go straight and try to intersect their line of travel. It is preferable that the fly sinks to the bottom before the fish gets there. The correct weight of the fly in relation to the depth of water must be spot on. 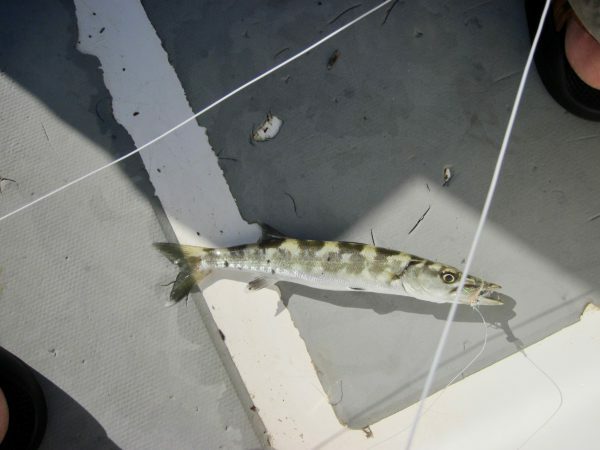 I was skeptical about claims that the fish could sense the boat at 60 feet, but I came away a convert. Just by rocking the boat slightly is enough. Once I stumbled slightly and put my foot down a bit too hard and the fish in my sights bolted. This is one moving part we can have control over. Move slow and do not make any noise that is unnecessary. Barefoot on the bow is probably the best option, otherwise wear something soft on your feet. 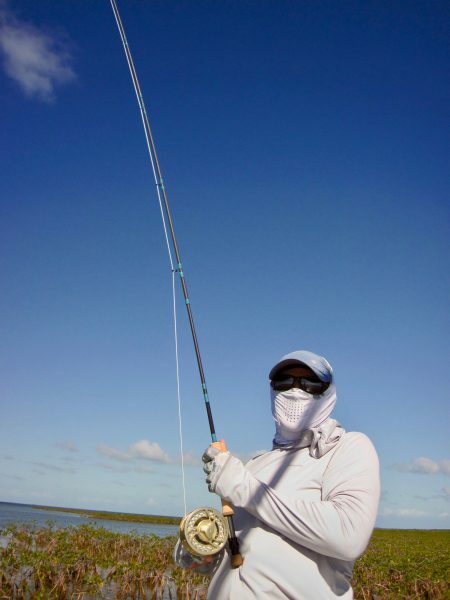 One needs to pay constant attention to the surroundings because the mangroves will happily eat your fly line if you place your back cast close to them. 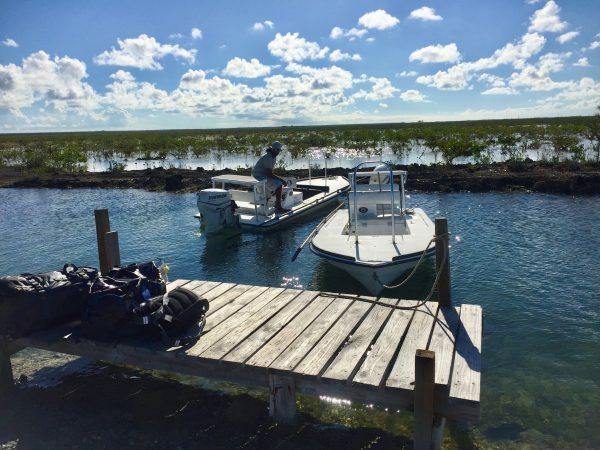 How to prepare for a Bonefish trip? It is tempting and easy to buy all the paraphernalia of fishing and equate that with success. That is not how it works. Most of the “moving parts” above are outside your control. 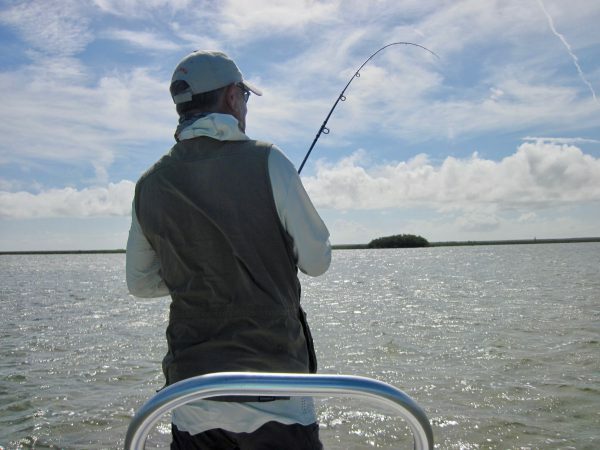 What is under your control is your casting prowess, your movement in the boat, and using correctly weighted flies (get the fly to the bottom before the bonefish arrives). Your casting is by far the single most important point. I have never met a person who casts too well. I have met a lot of fishermen who could improve their casts with simple corrections. You cannot buy a cast! That’s the way the cookie crumbles….